If you need a leather sofa cleaner in Liverpool (I also clean leather on The Wirral) then you’re at the right place. As well as cleaning leather upholstery, I can also carry out colour repairs. This skill also helps me spot a likely problem before it occurs during a deep leather clean and condition. Before I commence a leather clean, I always carry out a small test clean so as to show my customer how well the item in question is going to look. The only real issues when cleaning leather are wear and dye transfer from clothing. WHAT LEATHER DO YOU HAVE? 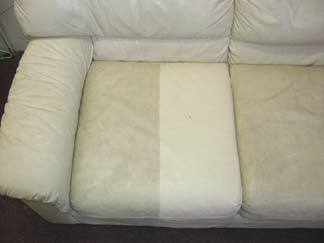 The system I choose for cleaning your leather couches depends on the leather type. Pigmented leathers (usually a white, cream, red, blue colour) can be cleaned using a specialist foam. Aniline leathers (usually a brown colour) usually benefit from a deep down degreasing and dye application treatment. Once your leather suite has been thoroughly cleaned it will be treated with a coating of wax and oil, this will help protect the furniture in the future. Depending on the condition of the leather upholstery I may use a contra-rotating brush extraction unit, or cleaning by hand may be a better idea. This will be decided upon once I see the leather suite. Any limitations on the leather clean will be highlighted before work commences. I can usually point out things like colour wear, small scratches etc. I don’t just limit myself to the Liverpool area, I also clean leather suites all over Merseyside. All of Dirtbusters cleaners customers in Liverpool can take advantage of my years of experience in repairing, re-colouring and restoring any areas of your leather suite that may have been damaged or worn. (I recommend using a leather cleaner that can repair as well as clean as problems can be spotted before they occur.) In most cases, I can match the colour of your leather suite to repair most types of colour loss. I find that most leather couch cleaners you can buy in supermarkets around Liverpool just don’t cut through the dirt and grease that your leather can hold. A lot of leather sofa retail stores also advise customers to use baby wipes to clean new expensive leather suites – this can only damage the top coat finish of the leather and is wrong. Maybe I can offer the same great service to the leather seats in your car, boat or even aircraft! My Leather cleaning and repair service is available all over Liverpool all the whole of Merseyside. When choosing a leather cleaner in Liverpool you need to ask – can you also repair colour problems on leather suites. This is important as any likely problems or limitations during the cleaning process will be evident to a more qualified leather cleaning technician. Fabric sofa’s, chairs and suites can also be deep cleaned. Most materials can be taken care of from cotton prints, through to delicate fibres. Along with this leather sofa cleaning service, I can also take care of floor tile cleaning and exterior jet washing in Liverpool. Please look around this website for more information.